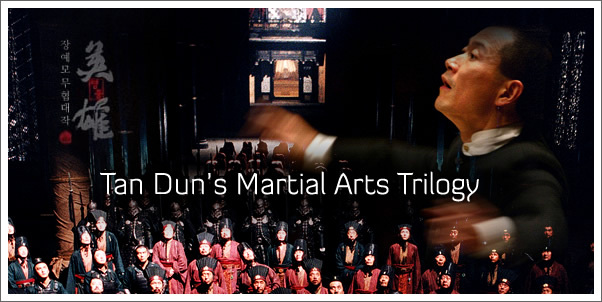 Martial Arts Trilogy features selected music from three critically acclaimed martial arts film soundtracks composed by Tan Dun - Crouching Tiger, Hidden Dragon, The Banquet and Hero. Available July 19, the compilation features world-renowned soloists Yo-Yo Ma, Lang Lang and Itzhak Perlman. Leading directors Ang Lee, Zhang YiMou and Feng Xioagang turned to Tan Dun’s dramatic music to help turn these films into cultural and artistic touchstones as well as box office hits. The recurring musical themes of this film trilogy – sacrifice, desire, transcendence, revenge, and power – demonstrate an artistic quality beyond film music that can be appreciated in its own right. This summer, The Martial Arts Trilogy Tour will bring Tan Dun’s music to large audiences across the nation. Tan Dun will conduct his compositions with various soloists at the Hollywood Bowl in Los Angeles and in New York City as part of the Lincoln Center Out of Doors program. This is followed by an eight-city tour of China, with stops in Beijing, Shanghai, Guangzhou and other major cities. The tour concludes with the NHK Symphony in Tokyo and at the Singapore Festival in December. Tan Dun’s innovative repertoire encompasses classical music, multimedia performance, and Eastern and Western traditions. He has conducted the world’s most famous orchestras, including the Royal Concertgebouw Orchestra, New York Philharmonic, Berliner Philharmoniker, Orchestre National de France, Philadelphia Orchestra and the Boston Symphony Orchestra. His ability to reach wide audiences is shown by his first Internet Symphony, commissioned by Google/YouTube and heard by over 25 million people online, and his multimedia work, The Map, which has toured more than 30 countries. Tan Dun has received numerous awards, including an Academy Award and a Grammy for Crouching, Tiger, Hidden Dragon, Japan’s Recording Academy Awards for Best Contemporary Music CD (Water Passion after St. Matthew) and the Grawemeyer Award.